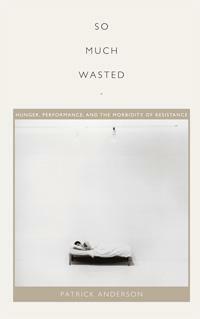 Traversing critical theory, body studies, psychoanalysis, philosophy, political theory, cultural studies, and performance studies, Patrick Anderson’s So Much Wasted captures the “politics of morbidity” embedded in the act of self-starvation. Anderson focuses on three settings—the hospital/clinic, a gallery, and a prison—to consider the way people who refuse food remain subject both to institutional means of force and control along with ideological constraints and mechanisms of discipline. What can these emaciated figures, hurling themselves toward death (or, as Heidegger calls it, “being-toward-death”), teach us about subjectivity, political resistance, and the production of power through everyday disciplinary practices? Anderson’s central claim—that self-starvation both refuses and reproduces the power of the state, and as such produces bodies and subjects capable of radically unsettling the status quo—weaves itself through many seemingly disparate moments: the political resistance of Turkish prison hunger strikes, the state’s imposition that Terri Schiavo must live despite her husband’s wishes, the life-threatening starvation performance art of Chris Burden (who, after staging his own shooting, street death, and near electrocution, asked others to watch as he wasted away for twenty-two days in a Venice Beach, CA art gallery), and Adrian Piper, Ana Mendieta, and Marina Abromovic’s staging of self-starvation as provocative, artistic disappearance. Perhaps most compelling is Anderson’s reimagining of leading feminist theorizing about anorexia as the internalization of misogyny (e.g., Susan Bordo, Susie Orbach); instead, he argues that anorexics may cultivate a “taste for power” that subverts dominant ideas about women, gender, and queerness as they dramatically rebel against state intervention. Suitable for numerous audiences—graduate courses in psychology, sociology, gender studies, and performance; scholarly audiences interested in bioethics, fatness studies, prisons, and the philosophy of selfhood; and those practitioners who work with self-starving or self-mutilating clients—this book carefully outlines a politics of resistance through dying, near-death, and “wasting away.” Even if it sometimes floats above its subjects a bit—for example, I kept wanting more content directly from those who have survived their self-starvation attempts—Anderson has written a book worthy of attention and study. By imagining rebellion as a refusal to consume, he forges new and powerful links between gender, sexuality, the body, and the ideological apparatus of the state as it faces the many rebellions of its subjects.